A very rich and dense snack – these protein bars are a great option to pop into your bag if you are heading into a dreaded long meeting or if you anticipate you may be skipping a meal on a day out. Low in saturated fat and packed with protein (10g protein per bar! ), they offer the lovely flavour combination of peanut and chocolate. 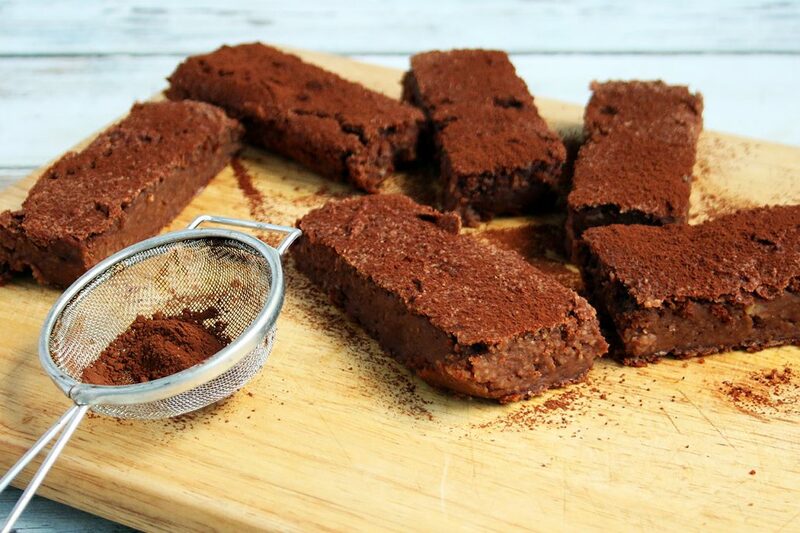 We dusted ours with additional cocoa powder for the pic, but that part is entirely up to you! Place the drained chickpeas, silken tofu, peanut butter and chopped apples into a food processor and blitz until smooth, scraping down the sides of the dish as necessary. Add the cocoa powder, sugar and vanilla essence and continue to blitz until the mixture is as smooth as it can get and all the elements are combined. Pour this mixture into a large bowl and add fold in the almond flour and baking powder. Combine well and tip into a greased baking dish to come up at least 2cm high. Bake in the oven for 35 minutes, then remove and allow to cool. Slice into 8 bars and wrap each one in foil and grab as needed. This colourful dish may look effortless, and although it’s a ‘one-pot’, it requires cooking in stages for optimum results. The smokiness of smoked paprika adds a huge amount of flavour overall and while Chorizo is no one’s first choice when it comes to lean meat, we believe everything in moderation, so we added a very small amount and cut it into smaller pieces to go further – a nifty way to get some of that smoky deliciousness in every bite. 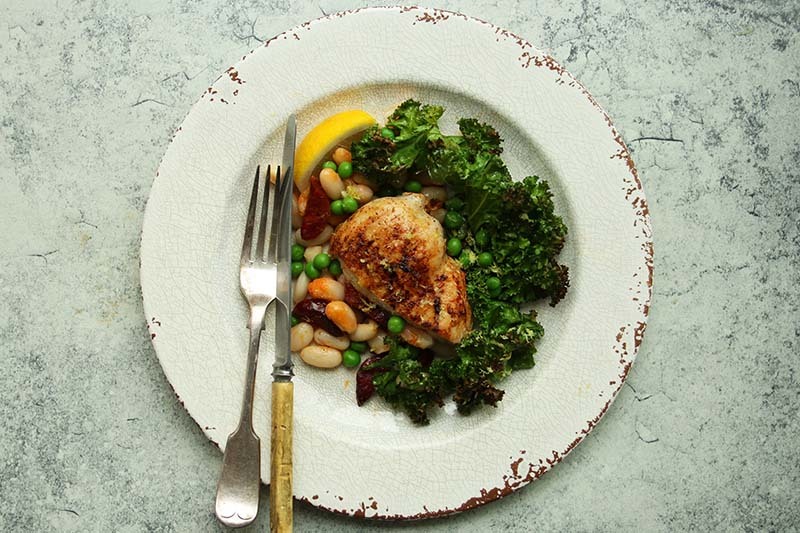 Included are cannellini beans and crispy kale, making the dish a substantial winter dinner, and the peas are a lovely sweet addition to an otherwise perfect meal. Serve the dish to the table as is, and tuck in! Season the chicken breasts on both sides with salt, freshly ground black pepper and smoked paprika, rubbing the spice in well. In a pan over moderate-high heat, heat one teaspoon olive oil and brown the chicken breasts on both sides until golden and caramelised. Remove and place on a chopping board and cut each one in half diagonally. Please be mindful that the chicken would not have cooked through at this stage and that you are still working with raw chicken. Place the chicken pieces into a greased oven-proof dish and place into the oven for 10 minutes. In the meantime, place the cannellini beans, Chorizo pieces and kale into a large bowl and drizzle over the remaining teaspoon olive oil. Use your hands to toss the mixture ensuring all the elements, particularly the kale is well-coated in the olive oil. After 15 minutes, remove the chicken from the oven and add the beans, Chorizo pieces and kale to the roasting dish. Place back into the oven for 5 minutes to warm the beans through and crisp up the kale. While the dish in cooking in the final 5 minutes, add boiling water to the frozen peas and allow to stand for a few minutes. This should cook them through sufficiently and hold their colour and sweet flavour. To serve, drain and add the peas to the dish, then use a microplane to finely grate the lemon zest over. Serve with additional wedges of lemon. 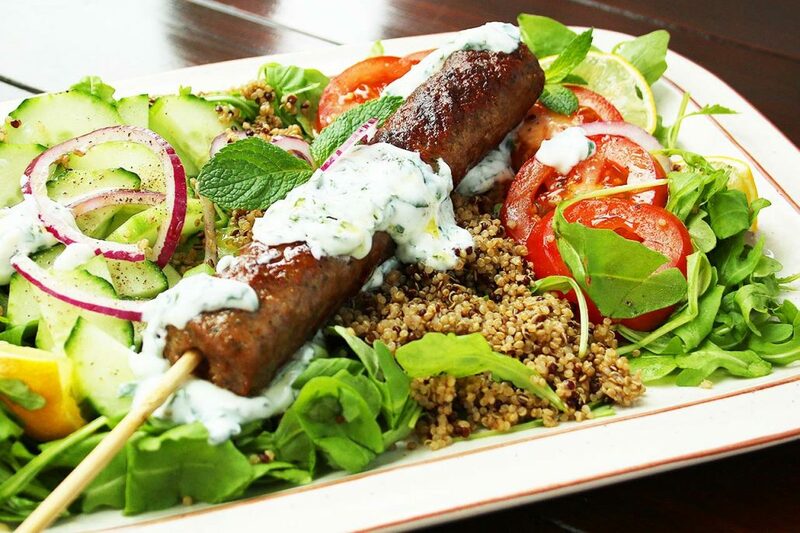 Lamb koftas, particularly those from ATHLEAT are packed with flavour and are just the right size to add to a salad spread such as this. A minty and zingy crème fraiche offers a refreshing and cooling balance to the spicy flavours of the kofta. Heat one teaspoon olive oil in a large griddle pan and grill the koftas over medium-high heat until browned and cooked through. Remove and place in a warm oven. Combine the crème fraiche and finely chopped mint in a small bowl and season with lemon juice, salt and freshly ground black pepper. Divide the prepped cucumber, tomatoes, red onion and cooked quinoa (warm or cold) between two bowls or plates and place the cooked kofta on each. Serve with the minty crème fraiche and lemon wedges which should be generously squeezed over the dish. Steaks do not necessarily need to be served with a creamy, calorie-laden sauce. Assuming you like your steak done medium or medium-rare, a good fillet doesn’t require an accompanying sauce at all. However, we have opted to include vegetables as our topping making it a complete meal. By caramelising and softening the peppers, this dish not only delivers on additional fibre and goodness, but it’s an attractive dish bursting with colour and flavour too. Heat one tablespoon olive oil in a pan over moderate heat. Add all the peppers and cook until caramelised. Reduce the heat to low and cover with a lid, cooking them until they completely soften and wilt, stirring often. Add the garlic three-quarters of the way through. Season the steaks with freshly ground black pepper, then grill in a separate pan until browned and caramelised and done to your liking. If you have a thermometer probe, cook to 50°C and then remove from the heat to rest, where it will continue to rise to about 55°C – a perfect steak. 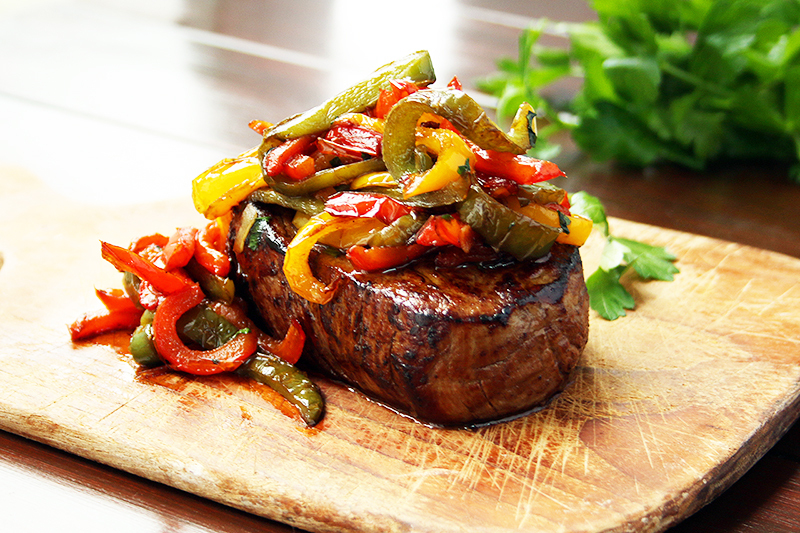 Season the steaks with sea salt flakes and top with the mountain of caramelised peppers. Garnish with chopped parsley and serve with salad of your choice. Grilled squid is a great option for a lean, protein to add to a salad. Prepping and cooking it probably takes quicker than opening and seasoning a can of tuna (and so much more interesting). There is no fancy dressing needed – as with all seafood, you simply need a good quality olive oil, salt and the all-important freshly squeezed lemon. The addition of red peppers adds a lovely roasted dimension to the salad. We suggested to use any salad leaves of your choice, but rocket is a great option and should feature in your salad leaf mix. Lay the defrosted squid on a tray lined with kitchen paper and pat as dry as you can with additional kitchen paper. Slice each squid one in half lengthways (top to bottom), and open it up, patting the inside dry as well. Use a sharp knife to lightly score a criss-cross on the side that was the inner side. You should have 8 pieces. Heat the olive oil in a pan and place the pieces of squid into the hot pan. Fry on both sides until lightly golden, this only takes about 1-2 minutes. You may need to do this in 2 batches, else the pan will become overcrowded and the squid will just simmer and not grill golden. Remove the cooked squid (which would have curled up) and season with salt and freshly ground black pepper. 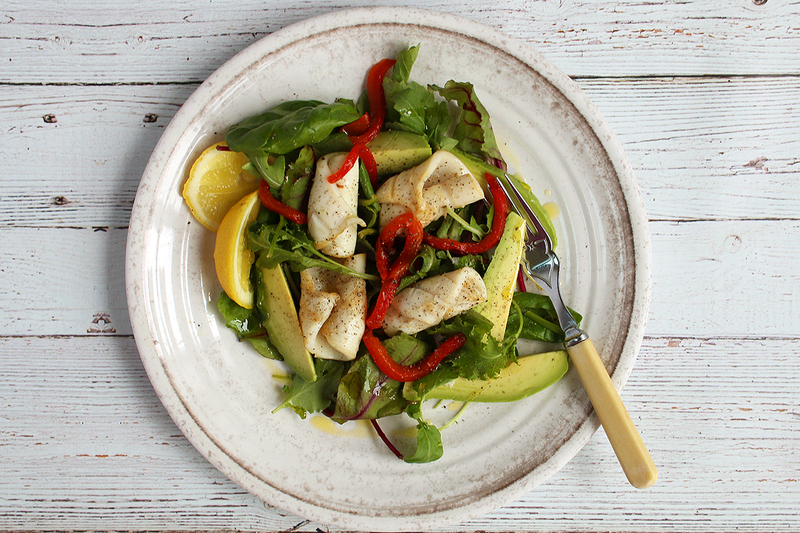 To assemble the salad, simply combine the salad leaves, sliced avocado and thinly sliced roasted red peppers. Add the calamari and drizzle olive oil over the salad. Season with sea salt flakes and serve with lemon wedges which should be generously squeezed over the salad. A great option for those who are gluten-intolerant! 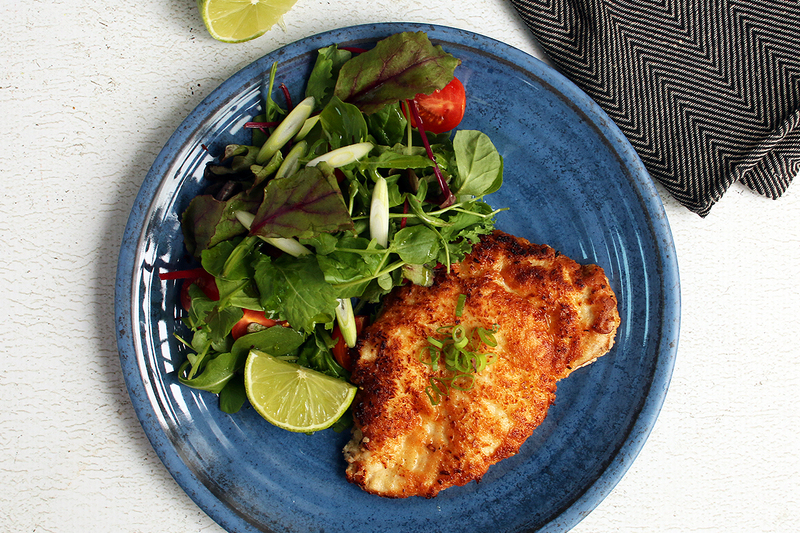 We crumbed our chicken breasts in a mixture of coconut flour and desiccated coconut and lightly fried them. What goes well with coconut? Lime, of course, which should be generously squeezed over. A lovely, fresh way to enjoy chicken breasts. We have it pictured here with a simple, green salad, but grilled vegetables may be a better option for winter – which is just around the corner! Place two tablespoons of coconut flour into the first bowl. Place the whisked egg into the second bowl. Place the second-mentioned two tablespoons coconut flour into the third bowl, as well as the two tablespoons desiccated coconut, mixing to combine. One at a time, place the chicken breast between two sheets of cling film and flatten using a flat side of a meat pallet to approximately 1.5cm thick. Remove and season with salt and freshly ground black pepper. Place each breast (one at a time) into the first bowl, coating the chicken on both sides in a dusting of the coconut flour. Shake off excess flour. Then, dip the chicken into the egg mixture and allow the excess egg to run off back into the egg bowl. Lastly, lay the chicken in the third bowl, pressing the chicken into the coconut/desiccated coconut mixture on both sides. Do this with both pieces of chicken. Serve with lime wedges which should be generously squeezed over. 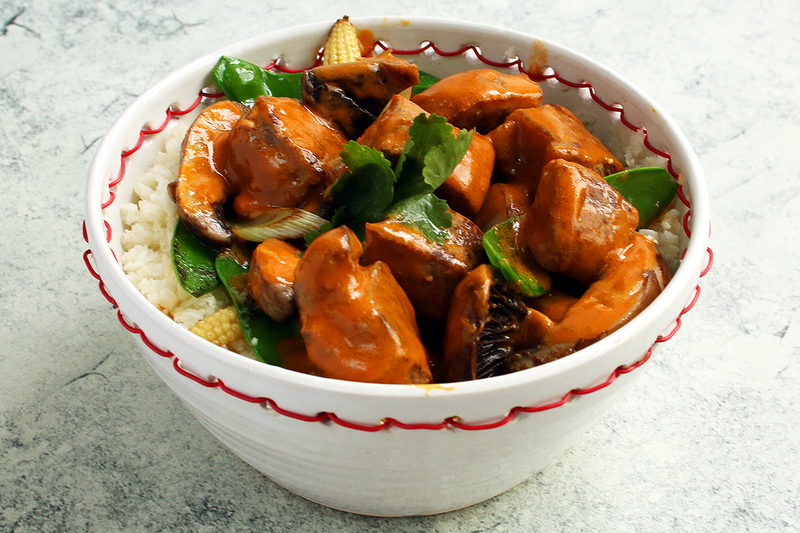 A deeply-satisfying Thai curry that can be served over any starch of your choice*. There is a handy tip here on how not to overcook your meat and veg: Simply fry them off beforehand and remove from the pan, then reduce your sauce before returning the meat and veg to the pot. You are left with tender meat and perfectly-cooked vegetables that retain their colour. *We have calculated the macros assuming you will serve it over cooked cauliflower rice. Heat one teaspoon olive oil in a large pan and brown the cubes of sirloin over high heat on all sides. Remove from the pan and set aside. Reduce the heat to medium-low and add a second teaspoon olive oil, lightly fry the spring onions and mushrooms for 1 minute. Add the baby corn and mange tout and fry for an additional minute. Remove from the pan and set aside. Return the beef cubes and vegetables to the pan and simmer for a minute or two to cook the beef through and warm the vegetables. The sauce should be sufficiently thickened by this time. Serve the creamy curry over any starch of your choice (like wild rice or egg noodles), or of you are on a very low-carb diet, serve it over cooked cauliflower rice or shirataki noodles. Garnish with coriander leaves. A scrumptious and satisfying breakfast where the ‘bread’ can be made ahead of time (and even frozen!) It’s important to mention that the Tupperware dish we used was an 11cm x 11cm lunchbox dish – simply perfect to mimic sandwich size. Try and get as close as you can to this. While these slices freeze perfectly, we don’t advise doubling the recipe if you want more yield – instead make separate batches inside the microwave to ensure thorough cooking. It’s worth it because this is a game-changer for those doing keto! Combine all the ingredients to make the ‘bread’ in a small bowl. Grease a small microwave-friendly dish (see the head note for tips on size) and spoon the contents in. Cook on high in the microwave for 90 seconds, then remove. Tip the solid mass out onto a chopping board and allow to cool. Once cooled, turn the mass on its side and slice into 3 slices. Set aside. Roughly crush half the avocado in a bowl using the back of a fork. Season with salt and pepper and squeeze a lemon into the mixture. To finish the dish, heat the olive oil in a small pan and lightly fry two slices of microwave bread until toasted on both sides. 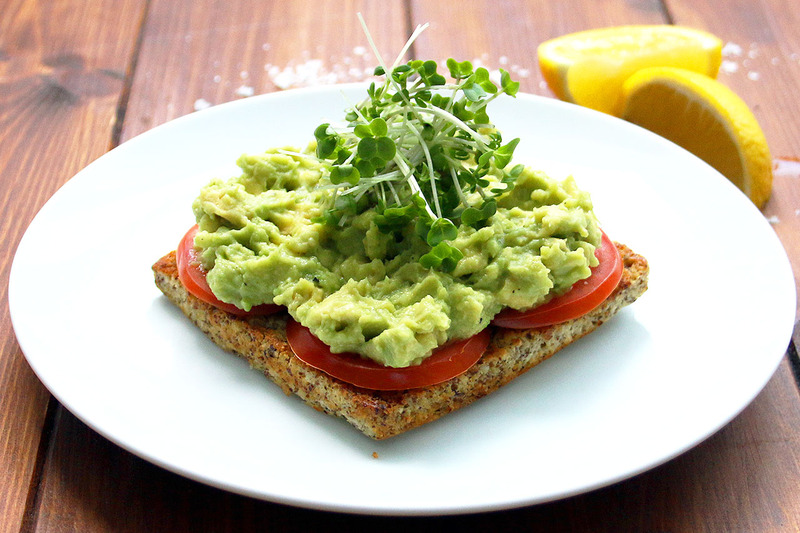 Remove, then lay the slices of tomato on each and top with the avocado mixture. Garnish with the salad cress. 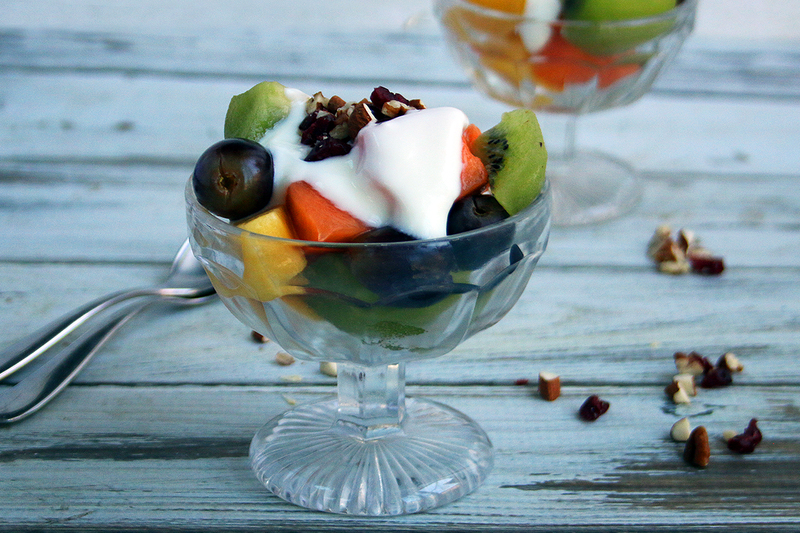 What could be simpler than a fruit salad with yogurt and nuts? It may seem a little uninspiring, but the key is to make sure you are getting the right amounts of each. Select an exotic mix of fruit and make sure the yogurt is fat-free. Play around with different chopped nuts and dried fruit, and you have the perfect crunchy topping. It’s such a sweet deal, you may not even need the honey drizzled at the end. Simply divide the fruit salad evenly between two breakfast bowls. Top with a dollop of plain yogurt and scatter over the nuts and cranberries. Drizzle with honey or maple syrup, if desired. 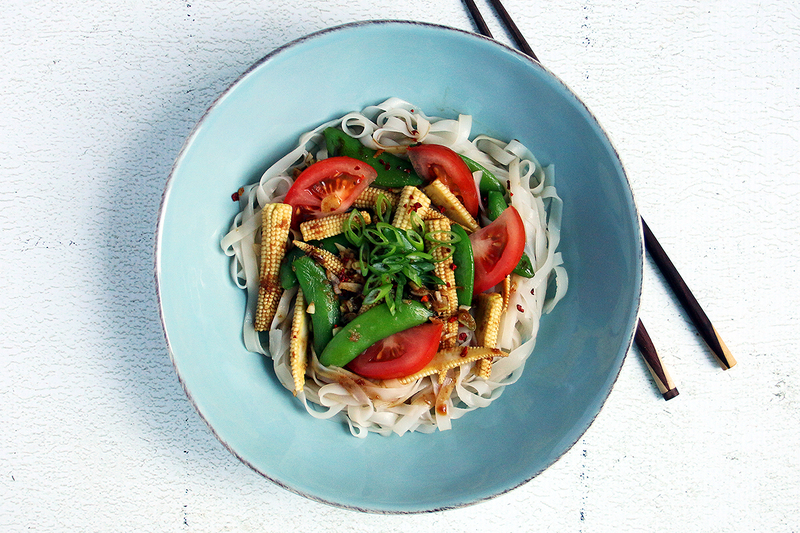 A delicious Asian-inspired rice noodle stir-fry with fresh tomatoes added for fun. Rice noodles are prepared by simply rehydrating in hot water, making this a quick and satisfying option for meat-free Mondays. Use any vegetables you on hand, but partially-cook them like we have done to ensure they are perfectly cooked. Bring a pan of salted water to the boil and add the baby corn and sugar snap peas. Cook for 2 minutes, then drain and set aside on a tray lined with kitchen paper. Pat dry. Heat the sesame oil in a large wok and gently fry the garlic, white parts of the spring onion, minced lemongrass and ginger until softened and fragrant. In the meantime, place the rice noodles in a bowl and pour boiling hot water from the kettle to cover. Allow to stand for one minute. Drain well and tip the softened noodles into the wok, along with the partially-cooked baby corn and sugar snap peas. Add the soy sauces and the sugar and increase the heat. Cook another 1-2 minutes until everything has warmed through and the noodles and vegetables are evenly coated in all the lovely juices and flavours. Divide the mixture between two bowls, adding the tomato wedges, then garnish with the green parts of the sliced spring onions you set aside and some chili flakes, if desired. An additional teaspoon drizzle of sesame oil over each will bring it all together.